So against every instinct I have in regards to professional football, this weekend I attended the Pittsburgh Steelers Fan Blitz. And you know what? It ended up not being too bad. Let me say this. I didn’t always used to be so anti-Steeler; in fact, I even used to have a Steeler shirt. I think it was something about former fullback Chris Fuamatu-Ma’afala (yes, I 100% had to look up how to spell that). But somewhere, somehow, I grew to utterly despise a few current and former Steeler players, and it really has just snowballed since then. See, I am a Cowboys fan, and although we’ve had it rough the past couple years, this is the year we are turning it around. Just wait. Both of today’s shot are different views of Heinz Field from last Saturday. One of the cool things about being down at the Fan Blitz was that you got to walk on the field. They had drills and events for the kids and field goal kicking for everyone else. I took the shot above right at the corner of the open end zone, looking towards the rest of the field. I know that it is a little crooked, but I liked that you could see a father and son posing by the goal post, and if I straightened it, then it would have cropped out half their legs. This is a five exposure handheld HDR that I processed with Photomatix. I masked in the bottom third of the shot to correct all the ghosts as a result of the people moving. Today’s official shot is a different view of the field. I took this from the second level after one of the autograph sessions. Oh yeah, I completely forgot to mention that. 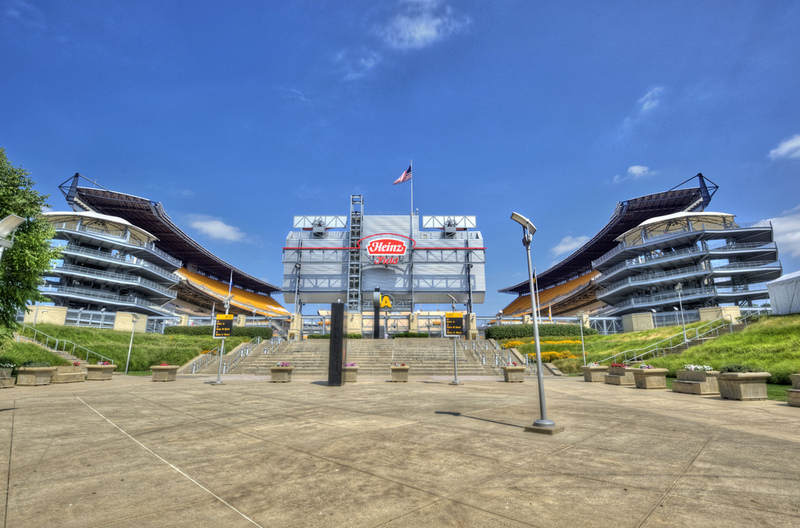 While I was there, I took a 20×30 HDR of Heinz Field that I had shot last fall in for the former players to sign and ended up getting 13 autographs. Pretty cool. We also ate lunch with former linebacker Andy Russell, who said that in his first year in the league he made $12,000. And now the players and owners are fighting of $9 billion. Unreal. Anyways, this is a nine shot panorama, with each shot being made up of a five exposure HDR, something that I hadn’t done before, at least not on this magnitude. It ended up looking pretty much the way I wanted it, although try as I may I couldn’t get the bit of grey in the sky over the middle part of the stadium fixed. Still happy with it. That’s all for today folks. See you tomorrow. Back and blogging after what seemed like too short of a weekend. Attended an ‘80s themed birthday party this weekend. Let’s just saying that it was…interesting. I did take a whole bunch of pictures, but I’m not sure I’ll be sharing them on here. People have reputations that they probably want to protect. Today is going to be somewhat of a catch up day on HDR Exposed, as Mondays usually are. I have a variety of pictures you post, seeing that I unconsciously post more random pictures on the weekend that during the week. Actually, I’m not sure if it has something to do with having more time on the weekend to take a look through my “For Flickr” folder than I have on my hard drive and pick out an interesting one, compared to the weekday, where I’m a bit more rushed and more or less just pick a random one from there. The backlog of shots is getting a little low, so I may need to get out shooting sometime soon. I’d like to do some street candids in Pittsburgh on a Friday or Saturday night, but I think that it is still a little too cold out for that. We even got more snow yesterday. I’m about ready for spring to come around, when we can leave the doors and the windows open and you don’t feel so cramped and stuffy in your own house. Soon, very soon, spring is coming. On to the shots. The first shot is a candid that I took while we were in New York, on Friday morning during the AM rush hour. Speaking of it being cold, it was absolutely FREEZING that morning, but I think at the time I took this shot my fingers hadn’t frozen yet. I was getting ready to cross the street in front of Radio City Music Hall when I saw this lady crossing the street. I captured her right when she was kind of making this goofy expression which just added to the shot. The only thing I didn’t capture was a perfectly crisp shot. Since it was so early and my first couple shots had been with a tripod, I hadn’t adjusted my ISO yet, so there was a little motion blur. I touched that up with Topaz InFocus then ran it through my typical cinematic processing steps, or at least my version of it. Decreased overall saturation, did a selective coloring adjustment on the red in her coat and the greens in the sign and bush. Added a Tonal Contrast Filter in Color Efex and the pillbox to finish it up. Next is my post from yesterday. This is another early morning shot, except this one is from the Steel City (Pittsburgh, just in case) a few Saturdays ago. Equally as cold but with the element of wind too. Fun stuff. Took this one soon after I arrived downtown, and my initial plan was the head over the Clemente Bridge. Well, I made it about this far, took the shot, then turned around, because the wind was really whipping across the water. So I took my seven bracketed shots and moved on. This is a view from the Clemente Bridge looking down the Allegheny River towards the Rachel Carson Bridge and Convention Center, which you can just see the first light of day starting to come up behind. For the processing, pretty standard to all the rest of the shots in this series. A seven shot HDR processed in HDR Efex under the “Natural” method. Adjusted sliders accordingly, then kicked it over the Photoshop and Color Efex. I masked in the enter sky of the -2 exposure, with some minor adjusting to the original shot. Desaturated the reds in the roads and from the lamps, as the D700 has a bit of problem sometimes with white balance. Masked out a corner of a piece of the bridge in the upper left and finally added a Low Key filter to the entire shot from Color Efex. On to today’s shot, which I will be posting a little later today on flickr. This is a panorama that I took last Wednesday on the far end of Mt. Washington in the late afternoon. I had some time to kill before heading to friend’s for the Penguin game. I had actually seen this exact shot, as someone in my office had it hanging in their office, so I think I would give it a try. I would have liked to do the panorama with my 70-200 zoom, but all I had was the 16-35 with me, so I took it at 35mm. On the right you can see the Point and the city of Pittsburgh and how high the water is. We got a lot of rain early last week, which caused all three rivers to rise, shutting down parking lots and some areas of the North Shore and the Point. I really like this vantage point too, because you can see the Monongahela River on the right, the Allegheny on the left, and where they converge to form the Ohio. Pretty cool stuff. On the left you can see Heinz Field, home of the Pittsburgh Steelers. On to the processing. This is a panorama of three 5 exposure HDRs, stitched together in CS5. The HDRs were created under in HDR Efex under the “Subtle” HDR method, as I didn’t want to go too heavy handed on the HDR since I was making a panorama. I didn’t like the way the sky looked, so I masked in the entire sky on all three HDRs. Adjusted the yellows of the bridges and Heinz Field to make them stand out and desaturated the browns of the lifeless trees to make them not to distracting. Lastly I corrected the skyline and gave the overall shot some definition in iPhoto. Whew. I’m exhausted. But today you got a little bit of everything, candids, regular HDRs and panorama HDRs. What more could you want?